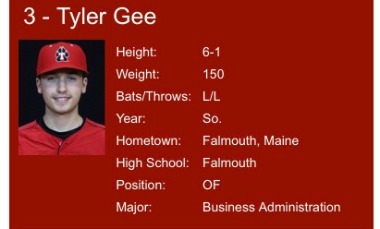 We have 7 from Falmouth Baseball who are playing college baseball in the 2019 season! Falmouth Yachtsmen Varsity got things moving in the first inning. Aube hit a solo homer. One bright spot for Sanford was a single by Marcus Gold in the second inning. Aube earned the victory on the mound for Falmouth Yachtsmen Varsity. He surrendered zero runs on five hits over seven innings, striking out 12 and walking one. Josiah Scott took the loss for Sanford. He allowed four hits and three runs over two innings, striking out two and walking one. Falmouth Yachtsmen Varsity launched one home run on the day. Aube had a dinger in the first inning. Falmouth Yachtsmen Varsity racked up nine hits. Garrett Tracy and Conner Coffin all had multiple hits for Falmouth Yachtsmen Varsity. 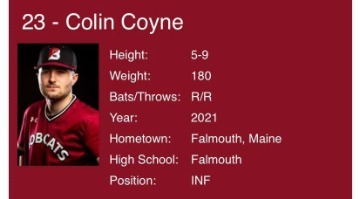 Coffin and Tracy each collected two hits to lead Falmouth Yachtsmen Varsity. Gold led Sanford with two hits in three at bats. Falmouth Yachtsmen Varsity couldn't keep up with Massabesic and fell 8-2 on Tuesday. Falmouth Yachtsmen Varsity fired up the offense in the second inning, when Garrett Tracysingled on a 1-1 count, scoring one run. Massabesic pulled away for good with three runs in the third inning. In the third Seth Wakefield doubled on a 1-1 count, scoring two runs and Braden Dagneault singled on a 1-1 count, scoring one run. Massabesic scored five runs in the fifth inning. Massabesic batters contributing to the big inning included Dagneault, Alex Shepis, Tyler Lambert, and Wakefield, all knocking in runs in the inning.Nick Roberge was on the mound for Massabesic. He surrendered two runs on six hits over four and a third innings, striking out one.Brady Douglas started the game for Falmouth Yachtsmen Varsity. He allowed eight hits and three runs over four innings, striking out two. Jack Kidder threw three innings in relief.Sam Kidder went 2-for-4 at the plate to lead Falmouth Yachtsmen Varsity in hits. Massabesic totaled 13 hits in the game. Lambert, Jake Gregoire, and Dagneault each collected multiple hits for Massabesic. Lambert led Massabesic with four hits in four at bats. Falmouth Yachtsmen Varsity got out to a four-run lead in the third inning and held on for a 5-4 victory over Deering on Saturday. Deering scored three runs in the failed comeback on a triple by Luc Harrison and a single by Benett Berg. Deering scored three runs in the seventh inning, but Falmouth Yachtsmen Varsity still managed to pull out the victory. Harrison and Berg each drove in runs during the inning.Falmouth Yachtsmen Varsity got things moving in the second inning. Sam Manganello singled on a 0-1 count, scoring one run.Griffin Aube led the Falmouth Yachtsmen Varsity to victory on the hill. He went six innings, allowing one run on three hits and striking out six. Garret Aube threw one inning in relief out of the bullpen. Aube recorded the last three outs to earn the save for Falmouth Yachtsmen Varsity. Luke Hill took the loss for Deering. 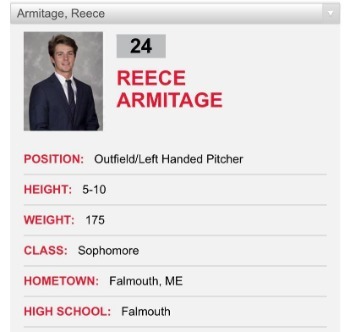 He went six and two-thirds innings, allowing five runs on ten hits and striking out seven.Falmouth Yachtsmen Varsity scattered ten hits in the game. 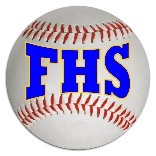 Aube, Will Bopp, and Ike Kiely each collected multiple hits for Falmouth Yachtsmen Varsity. Kiely, Bopp, and Aube each collected two hits to lead Falmouth Yachtsmen Varsity. Deering saw the ball well today, racking up five hits in the game. Keegan Stanton and Harrison all managed multiple hits for Deering. Falmouth Yachtsmen Varsity got out to a seven-run lead in the fourth inning and held on for a 7-5 victory over Windham on Thursday. Windham scored three runs in the failed comeback on a double by Ryan Sergent in the fourth and a sacrifice fly by Bryce Althim in the sixth. Windham scored three runs in the fourth inning, but Falmouth Yachtsmen Varsity still managed to pull out the victory. Windham scored its runs on a double by Sergent. Garrett Tracy took the win for Falmouth Yachtsmen Varsity. He lasted five innings, allowing six hits and four runs while striking out seven. 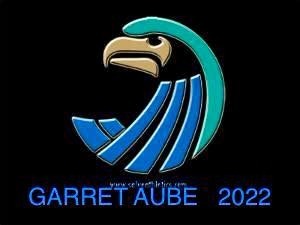 Garret Aube threw two innings in relief out of the bullpen. Aube recorded the last six outs to earn the save for Falmouth Yachtsmen Varsity.Tanner Bernier took the loss for Windham. He went three and two-thirds innings, allowing seven runs on six hits and walking one. Falmouth Yachtsmen Varsity collected seven hits on the day. 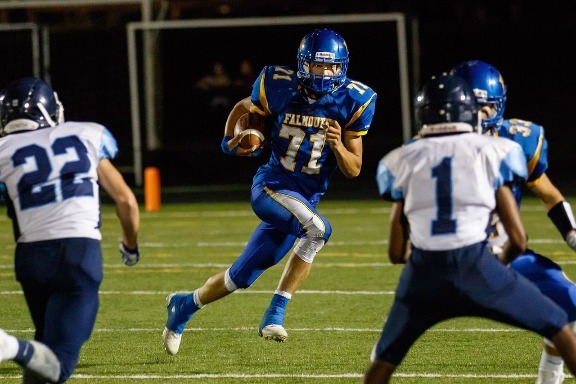 Ike Kiely and Conner Coffin each had multiple hits for Falmouth Yachtsmen Varsity. Coffin and Kiely each collected two hits to lead Falmouth Yachtsmen Varsity. Windham had seven hits in the game. 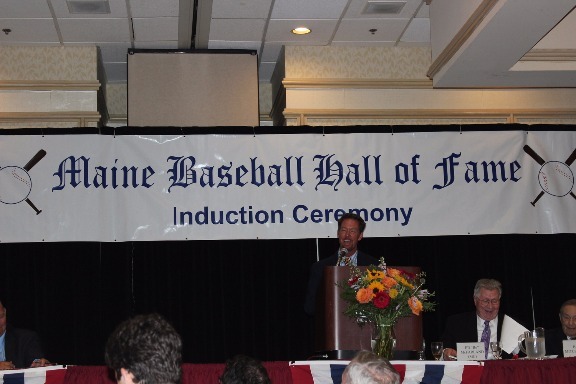 Sergent and Derek Foss each managed multiple hits for Windham. ​Even though Falmouth Yachtsmen Varsity gave up four runs in the seventh inning, they still defeated Kennebunk 8-5 on Tuesday. 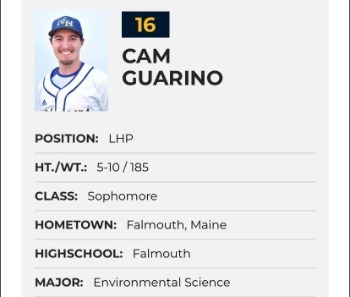 The offensive firepower by Kennebunk was led by Alex Champagne, Ryan Connors, and Nick Tequis, all knocking in runs in the inning.Falmouth Yachtsmen Varsity got things started in the first inning when Sam Kidder singled on a 0-2 count, scoring one run. Falmouth Yachtsmen Varsity notched five runs in the sixth inning. 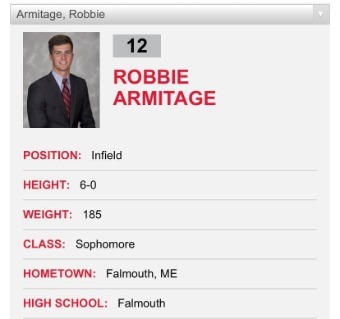 Griffin Aube, Kidder, Will Bopp, and Jack Kidder each had RBIs in the frame.Aube was credited with the victory for Falmouth Yachtsmen Varsity. He allowed zero hits and zero runs over four innings, striking out six. 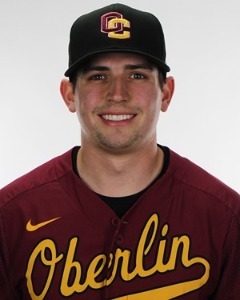 Kidder threw three innings in relief out of the bullpen. Kidder recorded the last nine outs to earn the save for Falmouth Yachtsmen Varsity. 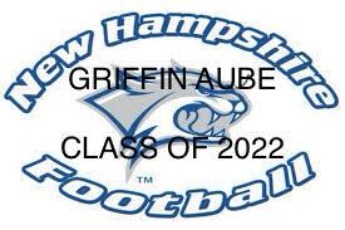 Chris Grady took the loss for Kennebunk. 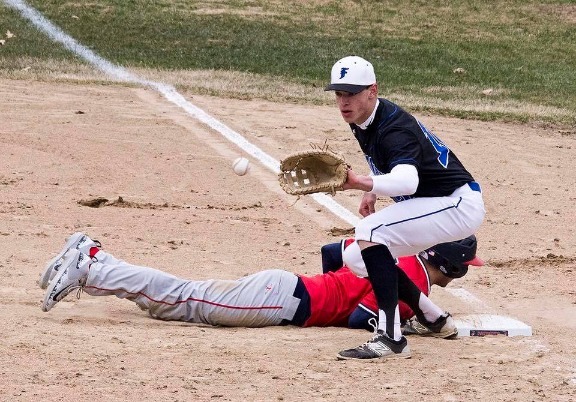 He surrendered five runs on eight hits over five and a third innings, striking out two.Falmouth Yachtsmen Varsity collected ten hits on the day. Kidder and Garret Aube each had multiple hits for Falmouth Yachtsmen Varsity. 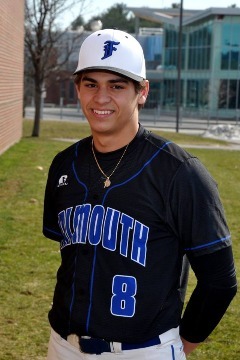 Aube and Kidder all had two hits to lead Falmouth Yachtsmen Varsity. Falmouth Yachtsmen Varsity stole six bases during the game as two players stole more than one. Kidder led the way with two. 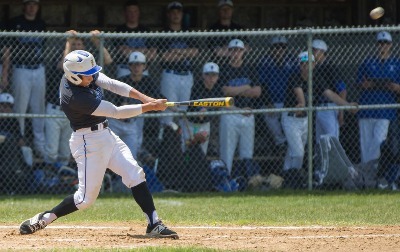 Derek Smith led Kennebunk with two hits in three at bats. ​Tuesday's game against Thornton Academy was a heartbreaker for Falmouth Yachtsmen Varsity, as they lost the lead late in a 6-4 defeat. The game was tied at four with Thornton Academy batting in the bottom of the sixth when an error scored one run for Thornton Academy. Thornton Academy got things moving in the first inning. Seymour doubled on a 1-1 count, scoring one run. Searle-Belanger was the winning pitcher for Thornton Academy. He lasted two innings, allowing one hit and one run while striking out four and walking one. 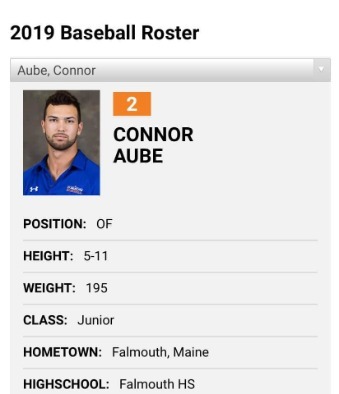 Conner Coffin, Ike Kiely, Griff Aube, Aube, and Sam Kidder each collected one hit to lead Falmouth Yachtsmen Varsity. Congratulations to this year's winners of the ​Edward J. 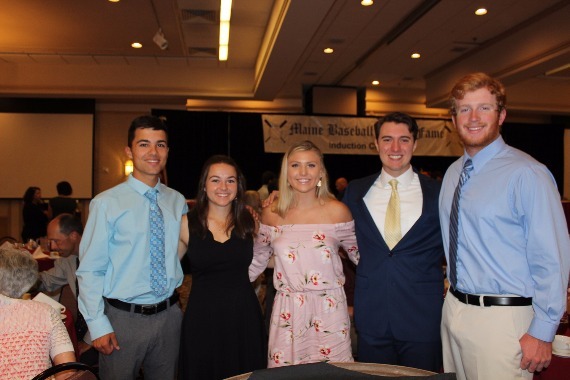 "Packy" McFarland Baseball and Marie W. Noel Softball Scholarships. 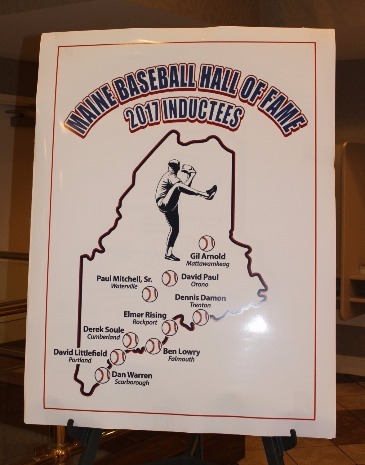 ​The Maine Baseball Hall of Fame is proud to award $750 scholarships to each of these outstanding men and women whose contributions to their school and community both on and off the field exemplify the qualities of leadership, sportsmanship and citizenship taught for many years by Packy McFarland and Marie Noel.